Above: A selection of Queensland sugar cane locomotives. These and other images can be found in the Image Collection. ARRANGEMENT OF LOCATIONS. The locations are arranged alphabetically, mill by mill. Ex Gin Gin Mill THISTLE, 1974. Previously ex Bingera Mill THISTLE, 1966. Converted from 0-6-0DM. Ex Mourilyan Mill, 2000. Previously ex Babinda Mill 19, 2000; ex Mourilyan Mill 7, 1999; ex Queensland Railways, Innisfail Tramway DL18 COORUMBA, 1977. Converted from 0-6-0DM, 1984. Out of use, 2003. Ex Moreton Mill BLI-BLI, 2005. Builder's plate numbered 6-1257-6-7-65 in error. On loan to Millaquin Mill for a short period in 1999. Ex Millaquin Mill, 2001. Previously ex Qunaba Mill, 1986; ex Roberts Construction (Pacific) Pty. Ltd., Clare-Dalbeg tramway construction, McDONALD, 1980; ex Holland-R.U.C. Joint Venture, 1979. Converted from 4wDH by Millaquin Mill, 1988; converted from 762mm gauge when rebuilt, 1979. Out of use. 1067mm gauge (This locomotive may be allocated to any Bundaberg Sugar group mill). Ex-Queensland Railways, purchased 1995 (for rebuilding). Stored at Bundaberg Foundry. Ex-Condong Mill (NSW) 2, 1973. Out of use, 2004. Ex-Hambledon Mill 2, 1974. Dismantled 2005. Ex-Inkerman Mill IONA, 1992 (for spare parts). Dismantled. Ex-Plane Creek Mill, 11, 1997. Ex-Macknade Mill, HOBART , 2003. Previously ex-Victoria Mill, 2002. Ex-Condong Mill (NSW) 9, 1975. Builder's plate numbered 6-1792-2-11-66 in error. Reported sold, November 2004. Ex-Victoria Mill, BRISBANE , 2004. Previously ex-Victoria Mill, BRISBANE for 2002 season. Ex-Hambledon Mill 7, 1991. Previously ex-Goondi Mill, 1987. Out of use; dismantled. Ex-Sugarworld, Edmonton , Sugarworld Shuttle, 1995. Previously ex-Hambledon Mill, 1989; ex-Goondi Mill 1, 1986. Converted from 1067mm gauge when rebuilt for Victoria Mill. Ex-Queensland Railways DH30, purchased 1993. Converted from 1067mm gauge when rebuilt for Victoria Mill. Ex-Queensland Railways DH17, purchased 1994. Converted from 1067mm gauge when rebuilt for Victoria Mill. Ex-West Australian Government Railways M1851, purchased 1994. Converted from 1067mm gauge when rebuilt for Victoria Mill. Ex-West Australian Government Railways M1852, purchased 1994. Fitted with remote shunting unit equipment, 2004. Ex-Victoria Mill, 2003. Previously ex-Harwood Mill (NSW), 1975. Dismantled. Purchased by Chris Hart, 2005. Ex-Victoria Mill, 1958. Converted from PM, 1958. Converted to ballast plough, 1989. Ex-Macknade Mill. Previously ex-Victoria Mill L CAR 2, 1997; ex-Macknade Mill 1996; ex-Victoria Mill, 1995. Out of use. Ex-Macknade Mill L CAR 4, 1995. Previously ex-Victoria Mill V1, 1990. Out of use. Ex-Homebush Mill, 1921. Preserved in working order, 1978. Converted from 1435mm gauge when rebuilt. Ex-State Rail Authority of New South Wales 7310, purchased 1994. Converted from 1435mm gauge when rebuilt. Ex-State Rail Authority of New South Wales 7318, purchased 1994. Fitted with remote shunting unit equipment, 2005. Converted from 1435mm gauge when rebuilt. Ex-State Rail Authority of New South Wales 7325, purchased 1994. Fitted with remote shunting unit equipment, 2004. Converted from 1435mm gauge when rebuilt. Ex-State Rail Authority of New South Wales 7346, purchased 1994. Fitted with remote shunting unit equipment, 2004. Converted from 1435mm gauge when rebuilt. Ex-State Rail Authority of New South Wales 7348, purchased 1994. Fitted with remote shunting unit equipment, 2005. Ex-Kalamia Mill, NORHAM, 1973. Converted from 0-6-0DH SCOTT, c.1985. Converted from 1067mm gauge when rebuilt. Ex-Queensland Railways DH20, purchased 1990. Converted from 1067mm gauge when rebuilt. Ex-Queensland Railways DH16, purchased 1993. Converted from 1067mm gauge when rebuilt. Ex-Queensland Railways DH18, purchased 1991. Converted from 900mm gauge when rebuilt. Ex-Cooks Construction Pty Ltd., Yallourn, Victoria 1999. Previously ex-Queensland Railways DH28, 1992 (1067mm gauge). Converted from 1067mm gauge when rebuilt. Ex Simsmetal Ltd., 1991 (for spare parts). Previously ex-Queensland Railways DH67. 1067mm gauge. Ex-Mt Isa Mines Ltd, 2001 (for rebuilding). Previously ex-Queensland Railways DH7, 1991. Dismantled. Track connected with that of Invicta Mill by means of dual gauge track shared with Pioneer Mill. Locomotives from Invicta Mill may be observed on temporary transfer. Converted from 1067mm gauge when rebuilt. Ex-Queensland Railways DH50, purchased 1991. Converted from 1067mm gauge when rebuilt. Ex-Queensland Railways DH19, purchased 1993. Converted from 1067mm gauge when rebuilt. Ex-Queensland Railways DH43, purchased 1995. 1067mm gauge. Ex-Queensland Railways, purchased 1995 (for rebuilding). Stored at Bundaberg Foundry. Ex-Victoria Mill, 1957. Converted from PM, 1956. 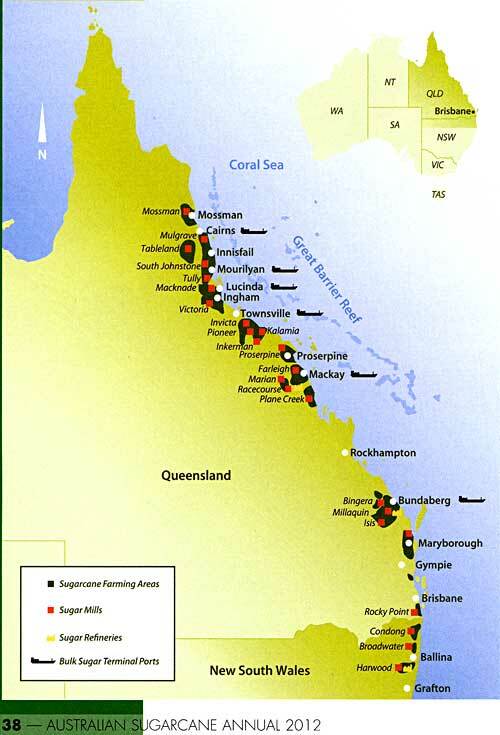 MackaySugar came into existence with the amalgamation of six different mills in 1988. Two have since been closed (North Eton & Cattle Creek). Track is interconnected between all mills. North Eton depot (Pleystowe Mill) is also used as a store for unwanted equipment. Navvy out-depots are at Finch Hatton (Marian Mill) and Calen (Farleigh Mill). Ex-Cattle Creek Mill TANNALO, 1991. Converted from 0-6-0DM by makers, 1972. Out of use 2004. Ex-Pleystowe Mill, 2004. Fitted for multiple-unit working with PALMYRA , 2004. Ex-North Eton Mill D3, 1988. Ex-Pleystowe Mill, 2005. Permanently coupled to work in multiple with MARIAN, 2005. Ex-Marian Mill, 2005. Previously ex-Pleystowe Mill, 2004; ex-North Eton Mill D8, 1988. Ex-Pleystowe Mill, 2004. Previously ex-North Eton Mill D7, 1988. Ex-Pleystowe Mill, 2004. Fitted for multiple-unit working with PLEYSTOWE, 2004. Ex-Roberts Construction (Pacific) Pty. Ltd., Clare-Dalbeg tramway construction, MARRIOTT, 1980. Previously ex-Holland-R.U.C. Joint Venture, 1979. Converted from 762mm gauge by EMB, 1979. Ex-Marian Mill, 2005. Permanently coupled to work in multiple with HABANA, 2005. Ex-Marian Mill 12 NELLIE (form. 3), 1999. Built for Marian Mill. "Rebuild" of Clyde Model HG-3R 0-6-0DH 64-377 of 1964 following accident, incorporating many parts from this loco, but utilising new frames. Ex-Pleystowe Mill, 2005. Previously ex-Farleigh Mill, 2004; ex-Marian Mill, 2004. Ex-Marian Mill, 2005. Converted from 1435mm gauge when rebuilt. Ex-State Rail Authority of New South Wales 7343, purchased 1993. Ex-Cattle Creek Mill PINNACLE, 1991. Ex-Cattle Creek Mill DALRYMPLE, 1991. Numbered 3 in error. Out of use 2004. Ex-Pleystowe Mill, 2004. Previously ex-Marian Mill, 2004. Converted from 1435mm gauge when rebuilt. Ex-State Rail Authority of New South Wales 7337, purchased 1993. Ex-Marian Mill, 2004. Previously ex-North Eton Mill D5, 1988. On loan to Farleigh Mill, 1999. Ex-Racecourse Mill, 2004. Previously ex-Farleigh Mill, LACY, 1999. Ex-Marian Mill, 2005. Previously ex-Farleigh Mill, 2003; ex-Fairymead Mill, 1990. Converted from 1435mm gauge when rebuilt. Ex-State Rail Authority of New South Wales, 7330, purchased 1993. Ex-Pleystowe Mill, 2005. Previously ex-Farleigh Mill, 2004. Fitted for Locotrol working with MICLERE, 2004. Converted from 1435mm gauge when rebuilt. Ex-State Rail Authority of New South Wales, 7305, purchased 1993. Ex-Pleystowe Mill, 2005. Previously ex-Farleigh Mill, 2004. Fitted for Locotrol working with CALEN, 2004. Ex-North Eton Mill D6, 1989. Out of use 2004. Built for Farleigh Mill. Converted from 0-6-0DM by 1976. Built for Farleigh Mill. Converted from 0-6-0DM by 1976. Out of use, 2003. Ex-Farleigh Mill, FINCH HATTON, 1997. Previously ex-Cattle Creek Mill, 1990. Ex-North Eton Mill D4, 1989. Converted from 1067mm gauge when rebuilt for Racecourse Mill. Ex-Queensland Railways DH70, purchased 1993. Built for Farleigh Mill. Builder's plate numbered 5-774-6-64 in error. 900mm gauge. Stored at North Eton Ex-Energy Brix Australia Corporation Pty Ltd, Yallourn , ictoria , purchased 2001 (for rebuilding). Previously ex-Cooks Construction Pty Ltd, Yallourn , Victoria , 1999; ex-Queensland Railways DH4, 1992. Offered for sale, 2005 for $55,000 without engine. 900mm gauge. Stored at North Eton Ex-Energy Brix Australia Corporation Pty Ltd, Yallourn , Victoria , purchased 2001 (for rebuilding). Previously ex-Cooks Construction Pty Ltd, Yallourn , Victoria , 1999; ex-Queensland Railways DH5, 1992. Offered for sale, 2005 for $80,000. 1067mm gauge. Stored at North Eton. Ex-Queensland Railways, purchased 1995 (for rebuilding). Stored at Racecourse Mill until 2003. 1435mm gauge. Stored at North Eton. Ex-State Rail Authority of New South Wales 7304, 1993 (for rebuilding). 1435mm gauge. Stored at North Eton. Ex-Bob Hague, c/- Goulburn Roundhouse Preservation Society, Goulburn, NSW, 1998. Previously ex-State Rail Authority of New South Wales , 7306. 1435mm gauge. Stored at North Eton. Ex-ADtranz Pty Ltd, c/- Rail Transport Museum, Thirlmere, NSW, 1998. Previously ex-State Rail Authority of New South Wales , 7308. 1435mm gauge. Stored at North Eton. Ex-Dorrigo Steam Railway & Museum, Hamilton , Newcastle , 1998 (for rebuilding). Previously ex-State Rail Authority of New South Wales , 7327. Dismantled. 1435mm gauge. Stored at North Eton. Ex-State Rail Authority of New South Wales 7332, 1993. Dismantled for spare parts,1996. 1435mm gauge. Stored at North Eton. Ex-State Rail Authority of New South Wales 7341, 1993 (for rebuilding). Converted from 0-6-0DM by 1976. Fitted for multiple-unit operation, 1986. Fitted for multiple-unit operation, 1981. Ex-War Disposals, 1952. Converted from 4wPM. Ex-Babinda Mill 1 JOSEPHINE, 2004. Converted from 0-6-0DM about 1981. Fitted for multiple-unit operation, 1999. Ex-Goondi Mill 5, 1987. Previously ex-Hambledon Mill 3, 1965. Fitted for multiple-unit operation, 1988. Ex-Goondi Mill 6, 1987. Previously ex-Victoria Mill ADELAIDE , 1976; ex-Hambledon Mill 5, 1958. Fitted for multiple-unit operation, 1988. Ran as unpowered brake tender 2002. Ex-Mourilyan Mill No.6, 1999. Previously ex-Queensland Railways Innisfail Tramway DL16 KORABINE, 1977. Converted from 0-6-0DM, 1983. Fitted for multiple-unit operation 1999. Ex-Babinda Mill (10) RUSSELL, 2004. Converted from 0-6-0DM about 1980. Fitted for multiple-unit operation, 1999. Ex-Mourilyan Mill 11, 1999. Previously ex-Goondi Mill 3, 1987. On loan to Fairymead Mill, 1989. Ex-Mourilyan Mill, 9, 2001. Previously ex-Queensland Railways Innisfail Tramway DL15 NERADA, 1977. On hire to Goondi Mill, 1978. Derelict by 2004. Ex-Mourilyan Mill 20, 2004. Previously ex-Moreton Mill, MORETON, 2004 via South Johnstone Mill. Built for South Johnstone Mill. Ex-South Johnstone Mill 26, 2003. Ex-Queensland Railways Innisfail Tramway DL20 PIN GIN, 1977. Ex-Queensland Railways Innisfail Tramway DL17 CURRAJAH, 1977. Ex-Queensland Railways Innisfail Tramway DL12 MOURILYAN, 1977. Built for South Johnstone Mill. Fitted for multiple-unit operation with A1102, 1986. Built for South Johnstone Mill. Fitted with Eimco bogies, 1988. Built for South Johnstone Mill. Converted from hydrostatic to hydraulic transmission when rebuilt. Also carries Eimco serial number L253 of 1990. Built for South Johnstone Mill. Converted from 0-6-0DM and fitted for multiple-unit operation with C1125, 1986. Built for Babinda Mill. Converted from 0-6-0DM about 1985. Out of use 1995; dismantled. Built for South Johnstone Mill. Converted from 0-6-0DM 14, 1986. Builder's plate numbered 6-881-6-64 in error. Ex-Hambledon Mill 5, 1991. Dismantled 1998. Converted from 1067mm gauge when rebuilt. Ex-Queensland Railways DH13, purchased 1994. Converted from 1067mm gauge when rebuilt. Ex-Queensland Railways DH31, purchased 1994. Ex-Hambledon Mill, 1991. Out of use by 1997. Ex-Hambledon Mill 6, 1991. Converted from 0-6-0DM, 1990. Previously ex-Kalamia Mill, SEAFORTH, 1990. Ex-Norman Park, Gordonvale, 1988. Previously ex-Mulgrave Mill, 1960. Converted from 0-4-2T and fitted for diesel fuel firing, 1989. Ex-Queensland Railways, purchased 1995 (for rebuilding). Stored at Bundaberg Foundry. Ex-Aramac Shire Council Tramway, 1976. Ex-Queensland Railways DH10, 1991. In service 1992. Ex-Queensland Railways DH60, 1991. In service 1993. Ex-Queensland Railways DH22, 1993 (for spare parts). Dismantled. Converted from 1067mm gauge when rebuilt. Ex-Queensland Railways DH12, purchased 1993. Locotrol master/slave loco. Converted from 1067mm gauge when rebuilt. Ex-Queensland Railways DH48, purchased 1993. Locotrol master/slave loco. Converted from 1067mm gauge when rebuilt. Ex-Queensland Railways DH64, purchased 1993. Locotrol master/slave loco. Converted from 1435mm gauge when rebuilt. Ex-Simsmetal Ltd., Newcastle, NSW, purchased 1995. Previously ex-State Rail Authority of New South Wales 7317. Fitted with remote shunting unit equipment, 2004. 1067mm gauge (stored for Victoria Mill). Ex-West Australian Government Railways MA 1861, purchased 1994 (for rebuilding). 1067mm gauge (stored for Victoria Mill). Ex-West Australian Government Railways MA 1863, purchased 1994 (for rebuilding). 1435mm gauge. Ex-State Rail Authority of New South Wales 7309, 1994 (for rebuilding). 1435mm gauge. Ex-Rothbury Riot Steam Railway & Museum Group Ltd, Branxton, NSW, purchased 1996 (for rebuilding). Previously ex-State Rail Authority of NSW 7336. Stored at Bundaberg Foundry. 1435mm gauge. Ex-State Rail Authority of New South Wales 7347, 1994 (for rebuilding). 1435mm gauge. Ex-State Rail Authority of New South Wales 7349, 1994 (for rebuilding). Builder's plate numbered 65-442 in error. Converted from 1067mm gauge when rebuilt. Ex-Queensland Railways DH46, purchased 1995. Converted from 1435 mm gauge when rebuilt. Ex-Bob Hague, c/- Goulburn Roundhouse Preservation Society, Goulburn NSW, 1997. Previously ex-State Rail Authority of New South Wales , 7314. Converted from 1435 mm gauge when rebuilt. Ex-Bob Hague, c/- Goulburn Roundhouse Preservation Society, Goulburn NSW, 1997. Previously ex-State Rail Authority of New South Wales , 7339. Ex- Rarawai Mill , Fiji , 11, 2004. Previously ex-Labasa Mill, 3, 1982. Stored at On Trak Engineering, Marayla, NSW. Ex- Rarawai Mill , Fiji , 12, 2004. Stored at On Trak Engineering, Marayla, NSW. Builder's plate numbered 6-1064-4-2-65 in error. Builder's plate numbered 6-1064-3-2-65 in error. Builder's plate numbered 6-1064-2-2-65 in error. Converted from 1067mm gauge when rebuilt. Ex-Queensland Railways, DH40, purchased 1995. Converted from 1067mm gauge when rebuilt. Ex-Queensland Railways, DH63, purchased 1992. Converted from 1067mm gauge when rebuilt. Ex-Queensland Railways, DH66, purchased 1991. Converted from 1067mm gauge when rebuilt. Ex-Cooks Construction, Dandenong, Victoria, purchased 1998 (for rebuilding) and stored at Maryborough (Q) until 2003. Previously ex-Queensland Railways, DH 24, 1995. Converted from 0-6-0DH TULLY No.9, 1988. 1067mm gauge. Dismantled. Ex-Cooks Construction Pty Ltd, Yallourn, Vic, purchased 1998 (for rebuilding). Previously ex-Queensland Government Railways, 1995. Stored at Maryborough (Q) until 2004. 900mm gauge. Ex-Cooks Construction Pty Ltd., Yallourn, Victoria, purchased 1999 (for rebuilding). Previously ex-Queensland Railways DH56, 1992. Stored at Maryborough (Q) until 2004.
last updated: 2 March 2016.